It’s difficult to imagine a more beautiful setting for the celebration of the rebirth of the stunning classic yacht Runa IV than the Gulf of Morbihan on a sunny summer’s day. 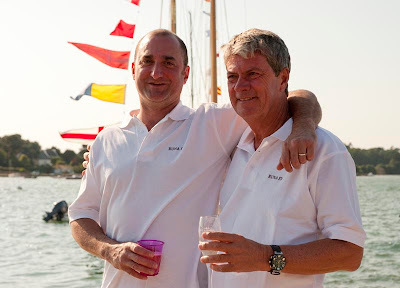 On May 31st, Louis Vuitton chairman and CEO Yves Carcelle – a man with an eye for the fine things in life - chose the magical Breton bay and its festival to mark the start of the lovely Gerhard Rønne-designed yawl, which first splashed on May 23rd 1918. IS RUNA IV YOUR FIRST VINTAGE YACHT? More than that: she’s my first boat! Every year I charter a sailing yacht for the family holiday but I’ve never owned any boats. HOW DID YOU FIND RUNA IV? Her line is magnificent and instantly moved me. But the idea of publicising her truly extraordinary story really thrilled me. HAS THAT CHOICE SOMETHING TO DO WITH YOUR MAXIM THAT SMALL ACTIONS MAKE BIG DIFFERENCES? The purchase was very simple: a phone call to the States. It was only later that I realised what kind of adventure I was letting myself in for. 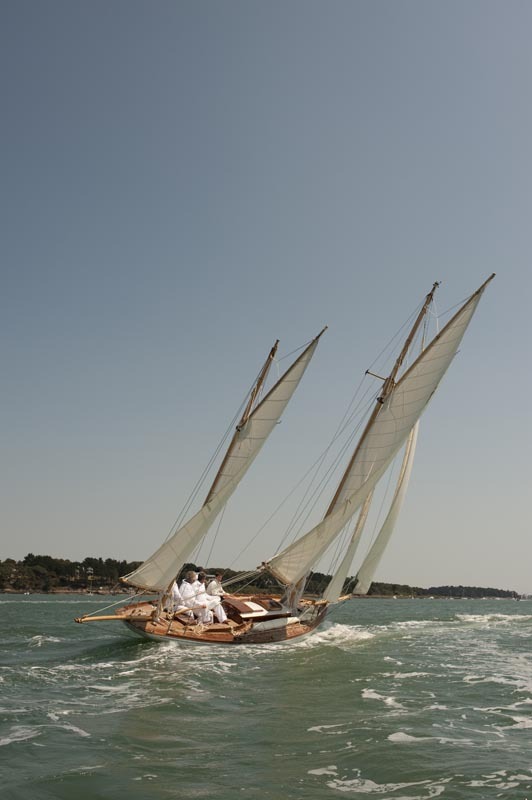 RUNA IV IS A WORLD REMOVED FROM THE RACING YACHTS OF THE LOUIS VUITTON AND AMERICA’S CUP. ISN’T SHE AN ODD CHOICE IN A WAY? Don’t forget that Louis Vuitton was the main sponsor of the Nioulargue for many years. So there’s no dissonance between tradition and modernity in that respect. 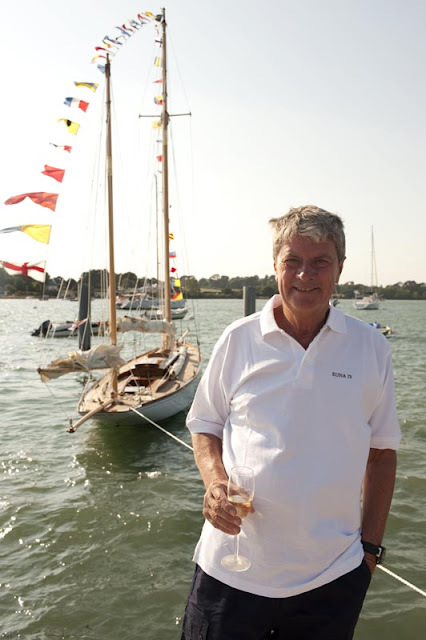 WHAT DID BRUNO TROUBLÉ (INVENTOR OF THE LOUIS VUITTON CUP, ED.’S NOTE) SAY ABOUT IT? ©Nigel PertHe was very enthusiastic and supervised the restoration with me. AS THE HEAD OF LOUIS VUITTON, DID THE WORD “TRADITION” HAVE A LARGE PART TO PLAY IN YOUR CHOICE OF RUNA IV AND HER RESTORATION? One side of the luxury world has to do with heritage conservation in general. I like to contribute, however modestly, to that. WHY DID YOU CHOOSE GUIP DI BREST, WHICH RESTORED ERIC TABARLY’S 1898 PEN DUICK, FOR THE PROJECT? I followed Bruno Troublé’s advice. They’re all huge enthusiasts, obsessed with detail. ARE THERE ANY PARALLELS BETWEEN THE SKILLS OF THE GUIP SHIPWRIGHTS AND LOUIS VUITTON’S CRAFTSPEOPLE? DID YOU HAVE TO MAKE ANY CLEAR CHOICES TO PRESERVE RUNA IV’S CLASSIC SPIRIT? Yes, particularly the decision to restore her to her original yawl rig. HOW DO YOU FEEL WHEN YOU SEE HER NOW? Like I’m looking at a beautiful work of art. YOU’RE ABOUT TO BUY RUNA VI, A 1927 DESIGN ALSO BY THE DANISH ARCHITECT GERHARD RØNNE. ARE YOU GOING TO CONTINUE THE COLLECTION? I don’t know if I personally will restore Runa VI, but I’m very happy we found her again. Runa III and Runa V are still missing. I hope they’re still out there somewhere! Maybe one day we’ll be able to reunite all of Gerhard Rønne’s Runas. It would be a magnificent way of looking back at the history of the boats designed between 1903 and 1945. YOU ARE TRAVELLING CONSTANTLY TO DEVELOP LOUIS VUITTON AND YOU LIKE TO SAY THAT YOU’LL SLEEP IN ANOTHER LIFE. 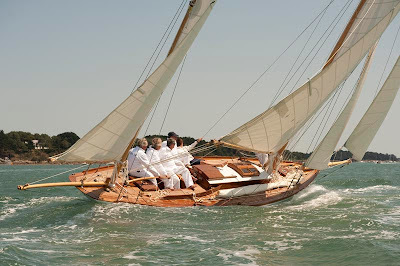 ISN’T THIS NEW PASSION FOR CLASSIC YACHTS AN UNUSUAL WAY OF BRINGING YOUR DREAMS OF ESCAPE TO THE FORE? We all need dreams. Even people, like ourselves, who don’t sleep very much.